(Bloomberg) -- The Bank of Italy cut its growth forecast for this year and next while signaling that the euro region’s third-biggest economy might have slipped into a new recession at the end of 2018. The economy is seen expanding 0.6 percent this year and 0.9 percent next, down from prior projections of 1 percent and 1.1 percent respectively, it said Friday in its quarterly economic bulletin. “New data have been published on international trade, economic activity and business sentiment in Italy and the euro area that generally indicate a less favorable development in the global and Italian economy,” the report also said. 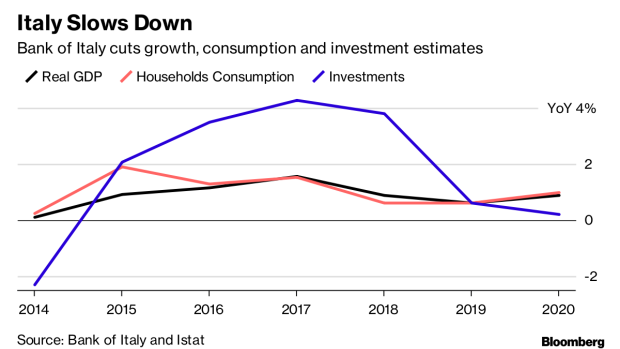 Italy has been struggling to break out of a years-long trap of economic stagnation, though the European Commission projects the country will have the slowest growth rate in the 19-nation euro area this year and next. The populist government is counting on its expansive budget and programs to spur economic growth. The revised outlook shows a marked reduction of the estimated investments this year to a 0.6 percent rise from a 2.1 percent increase previously forecast. The projection for household consumption’s rise in 2019 was also cut to 0.6 percent from a 1 percent increase prior. The central bank said that economy may have shrunk at the end of last year, de facto signaling that the nation slipped into recession, after a 0.1 percent contraction in the third quarter. In its December revised budgetary plan, the Italian government said it expected the economy to grow in the fourth quarter, offsetting the decline recorded in the previous three months. Earlier this week, a survey conducted by the Rome-based central bank showed that Italian businesses grew pessimistic about growth in the final months of 2018 and that their views of the general economic situation worsened markedly in all sectors. In its bulletin on Friday, the central bank added that the risks to Italian growth are tilted to the downside. --With assistance from Giovanni Salzano.